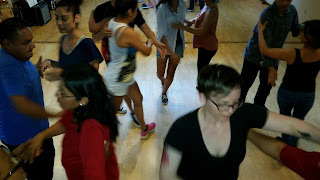 You work consistently to keep the rhythm on your feet (making a choice to listen to timba frequently every day), walking with no bounce or big steps, your center faces your partner's center, so you are actually dancing, not doing a pattern and showing off by yourself. For leads, your dance partners enjoy dancing with you. As follows, you minimize back-leading and let the Lead "lead" you, you automatically know basic casino dance communication and you walk forward. Follows, when leads ask you to dance, leads complement you for having a soft connection and being light as a feather in turn patterns. Lead/Follows stay close to their partners in turn pattern. Your leading/following for Dame, Dile Que No, Dame, Enchufla, Vacilela, and Exhibela is in muscle memory mode. You don't have to think too much about it if it's called. It is encouraged to take the Beginner Series Levels 1,2 & 3 at least twice because you will pick up more knowledge in the second round that was not readily processed in your memory in the first learning. Advance casineros always go back to basics! Persistence in the learning process. DON'T GIVE UP after one class or a series. We have all, including the instructors, messed up the rueda and caused a train wreck. If you are personally invested, take more classes. Intentionally FIND THE BEAT everywhere you go. Play Cuban music where ever you go, in your car, at the gym, at work on your headphones, while you are cooking..in the shower!! Scroll down below for Cuban music access. The more you are exposed to it, you will find the beat. It's a personal journey. To help you find the beat in different tempos, use "The Clave" app to help you with timing and footwork practice. This will get your ear trained to hear the clave in every song. You can buy it through Google Play or through iTunes. There are many apps that do the same thing such as the Salsa Rhythms app, Salsa Beats Beta app, Rhythm Trainer app. Practice! Practice! Practice! Think "Karate Kid The Movie!" Take the movement and repeat over and over again until it becomes muscle memory. Attend social dance events outside the classroom. Check the Upcoming Events Page to find out when we meet. If you are a "read first, move after" type of learner and love to read and learn about Cuban music and dance, I highly recommend reading the well detailed posts from the blog Son Y Casino by Daybert Linares Diaz. Use the Ruedawiki or Rueda Moves" video library links below to visually study and practice these moves outside the classroom. Check this amazing Wiki-based rueda library of dance moves! A good place to start for folks who are learning Cuban Salsa/Rueda for the first time and are visual learners! There's probably more, but you can do the research and/or Google it. These links are not the only links, but will keep building this list for popular places to listen and purchase the latest Cuban music. This recently was created for your mobile devises to get the most current Cuban music (timba, Son, Cubaton) spinned by some the the best DJ's, specifically DJ Warapo and DJ Melao. To listen to some really good timba, son, Cubaton, this link can give you the latest on the new music plus let you know which bands are touring direct from Cuba etc. There is a radio link on this website that will stream in some excellent mixes of timba music. This is an awesome internet radio station, spearheaded by the efforts of casineros and DJ's in France. You are sure to hear the latest and the greatest timba music. Below is a listing of congresses and festivals where you can get 4 to 5 days of the best exposure to Cuban dance instruction and the latest music. Seattle Cuban Dance Fest - July 12th -15, 2018 - REALLY FUN! Festivalsero.com - A link to all different dance congresses around the world; salsa cubana is in there. The DC Casineros did a fantastic job on building a list of rueda communities from the US and the world. This link was a really great find. It not only has a listing of places to dance casino or learn casino, but it will give you history and a lesson about what the "clave" is all about in the music and much more!